I truly think the greatest thing about having my girls is that I get to watch their relationship grow and develop on a daily basis. 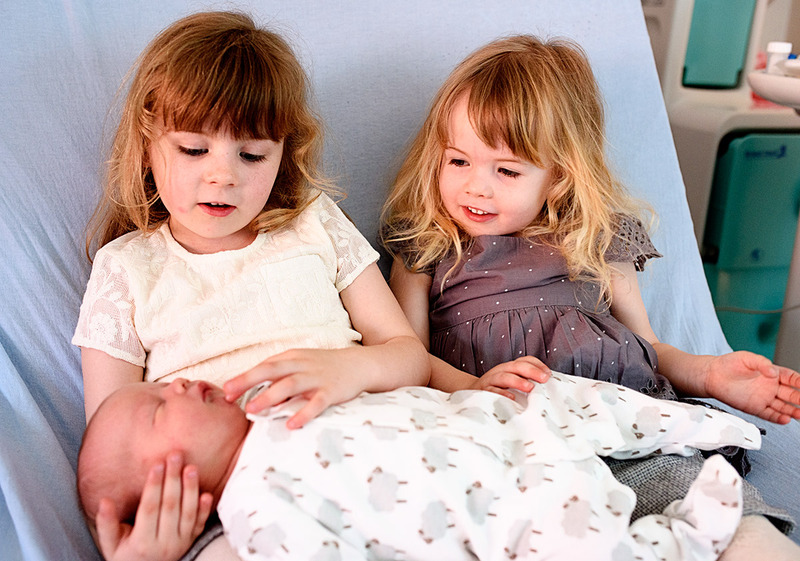 When I was pregnant with LL I of course had nerves about the dynamics of having two children and I was a little worried that Mads would feel left out or unsure about having a new sibling. For the most part I knew she would be amazing with her, but you still can’t help but have the odd jitters. 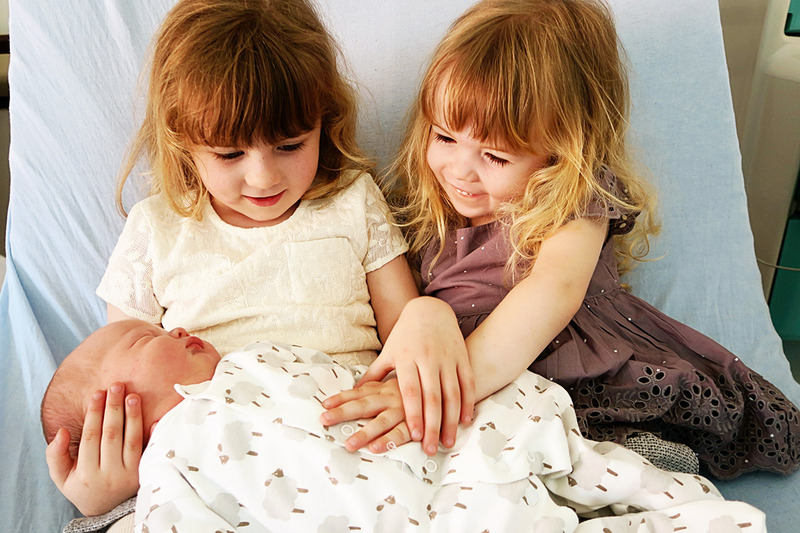 We couldn’t have been more lucky, from the second she met her little sister she has always been the most incredible big sister- truly incredible. It really has been so special to watch their bond develop over the years and nowadays they are the best of friends, even if that often involves bickering constantly, they still are as close as can be. I definitely had similar nerves in my third pregnancy but this time I was worried about what a third child would do to the dynamic of their relationship. However with hindsight on my side, I knew that our new baby would just perfectly slot in to our family when he or she was born. Then we found out we were having a boy and I literally was counting down the days for our baby to hopefully be born safely and for him to meet his two big sisters. I imagined in my head over and over again what the moment they met would be like. Because of the fact I had a c-section, we made the decision before hand that we would wait until Day 2 for our girls to meet their baby brother. This was because on the first day I would still have my catheter in and not be as mobile and I wanted to be able to get out of bed and also not worry the girls too much if they saw me in a more immobile state. On the first day in hospital my Mum, sister and sister’s boyfriend came to visit and then once I was up and moving around the next day (albeit slowly!) it was time for our girls to come in to meet him. We also decided that we would have our baby boy in his hospital cot when the girls came in. This was just so that I could focus my attention on them and we could get them to go over to see him when they were ready. Mr E went to get them both from school and nursery and he text me when he was in the hospital car park to let me know they were on their way up. I was so nervous and excited, and I had butterflies in my tummy. I could hear them walking through the ward and I will never forget their little faces as they appeared round the curtain (you can see them in my birth story video) but they looked so concerned and unsure bless them. I gave them a huge cuddle and then they went to see him in his cot and they looked so excited to finally meet their new ‘baby boy’. Then it was time for them to hold him. They were so excited and happily tried to make him play with ‘blue bunny’. Mr E bought both the girls an extra special bunny on the day they were born, so he wanted to do the same for him too. 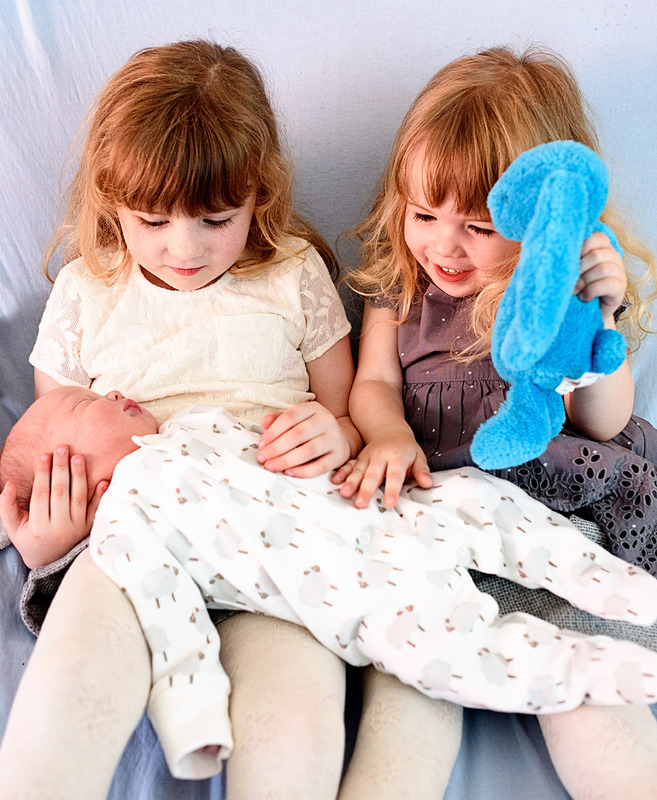 It was absolutely lovely to watch them with their baby brother, they were so incredibly loving towards him just as I thought they would be, although we did keep having to tell them to support his head. It was such an emotional and special moment, one which I will treasure forever- the first time my little family met for the first time. Since then the girls have been amazing with him. For the first week Mads was a little overwhelmed I think, if you didn’t know her you wouldn’t be able to tell, but she was just playing up ever so slightly, generally not listening and just being a bit needy, talking in a baby voice and just generally not being her normal self. She is obviously old enough to understand what is going on now, whereas when LL was born she didn’t really know properly. However all is back to normal now and she is just the most wonderful big sister, constantly wanting to hold her baby brother, cuddle him and be near him. In fact I feel horrible most of the time as she always wants to hold him just as he has fallen asleep and I have to tell her to wait. LL on the other hand hasn’t been phased in the slightest and again is just lovely with him, constantly cuddling him and wanting to hold him too. Both haven’t showed even the smallest amount of jealousy to him and have accepted him perfectly into our family. Three children wasn’t something I ever imagined. I always imagined two children, something which I have said many times before, two girls in fact. But then we decided if we were lucky enough we would like to add another baby to our family. It sounds cheesy but I feel like it was always destined to be our baby boy, it just seems like he was always meant to be here. 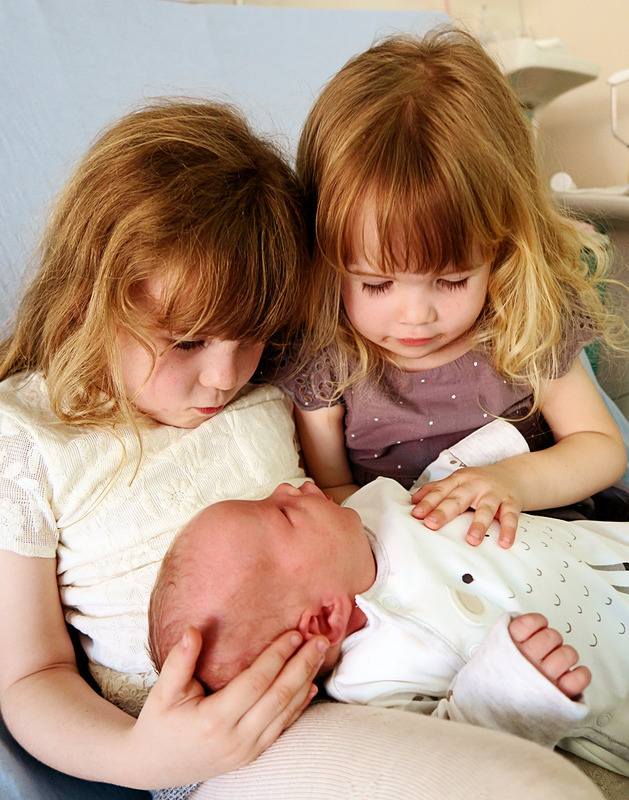 I cannot wait to watch my three little siblings grow and develop together, I feel like the proudest Mum in the world, although I am sure it will have its challenges along the way. As we adjust to our new sense of normal, I can’t but help feel a little emotional when I look at these photos. I will never ever forget the moment my three babies met for the first time. 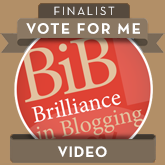 I’ve also been shortlisted in the ‘Video’ category in the BritMums #BiBs awards. 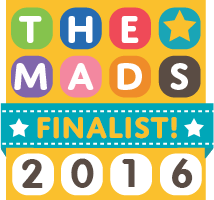 You can vote here for that one too. Thanks so much if you do, it only takes a minute but means so much. It’s lovely to feel recognition for something you are so so passionate about. Gorgeous photos! I love how carefully you planned the moment that they met, and it obviously paid off as it’s all gone so smoothly for you. I remember waiting for Carl to bring the girls in to meet Ernie, I was so excited, definitely the main moment I had been waiting for! My eldest wasn’t herself for a few days after Ernie came home either. She was nearly 4, so old enough to know what was going on but not old enough to process it properly and I think she found it a bit worrying When I was in hospital. It’s amazing how quickly they adapt though. Your sisters look proud as anything, he’s a very lucky little brother! This is so lovely! Your little girl’s close relationship is so clear from your photos and it’s obvious already how much they adore their little brother. I think introducing your older children to the newest member of the family must be such a special moment – I really hope we get to do that someday! Gorgeous photos Katie. What a moment to treasure! 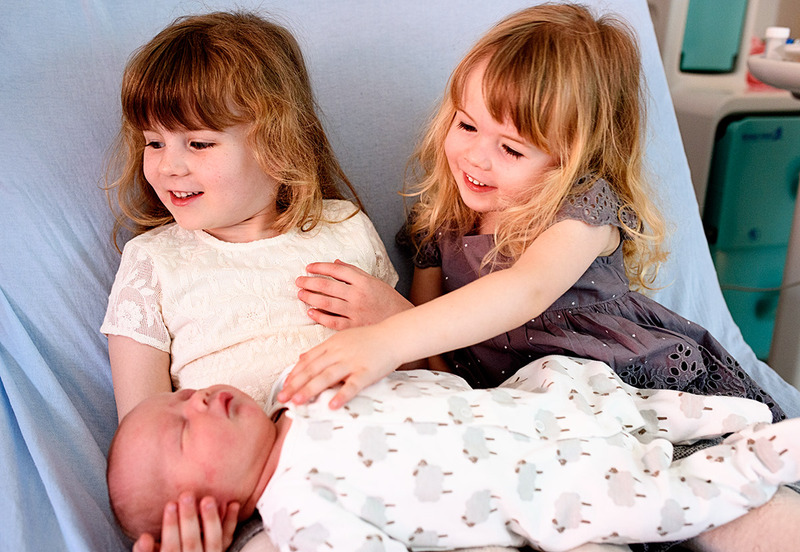 My two girls met for the first time at 4am, when I’d just got home from the hospital with our new baby and went upstairs to check on F – who then woke up and was too excited to wait until morning to meet her baby sister! It means all our first photos are blurry and dark, although obviously I still treasure them. It was all slightly surreal, looking back. So sweet! 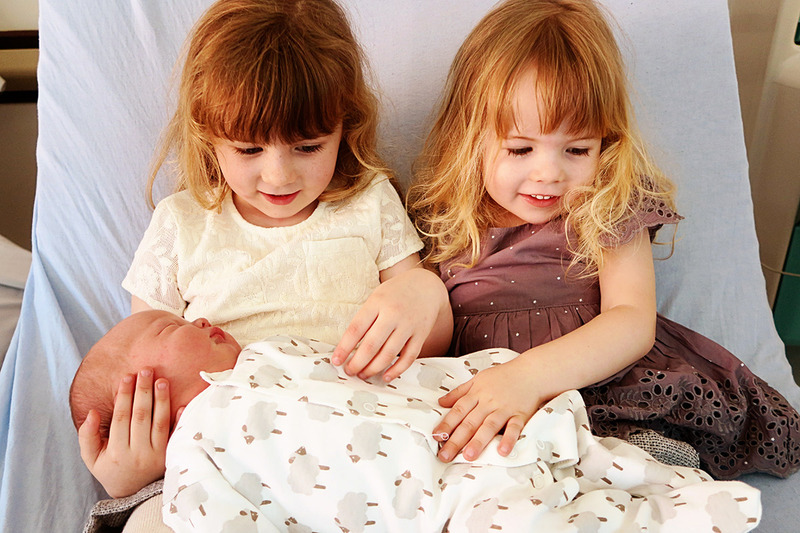 Both girls look incredibly proud of being big sisters to your gorgeous little boy. LL just has the cutest smile. Such a special moment, and lovely to have caught it on camera! Your three will have so much fun together! Such a joy to look on as Mama and see them forming their own little relationships, isn’t it? What an amazing moment. It is just so lovely when it feels like they’ve been here forever. 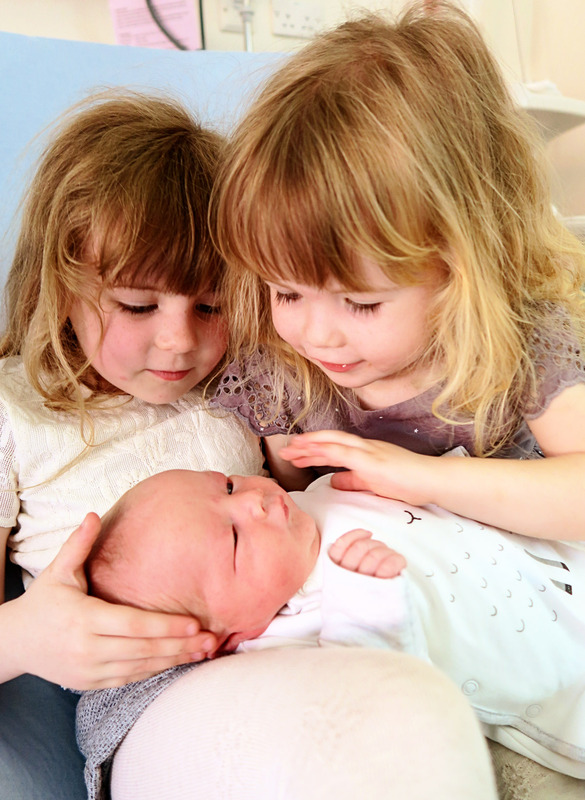 He’s very lucky to have two doting big sisters!